Warning: No more updates. This app stays as it is now. Why? Because Flash is essentially dead now. Browsers stop to support it etc. 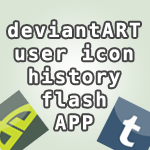 I might be create a HTML5 version of this app IF deviantART let us upload web apps in the future (as Newgrounds does). Until then this stays without any further improvements or updates. Thank you for all your comments and support I got for this app. It was a pleasure. I will respond and help as I can. This will not change. It changed I just do not fix anything in the app, also I do not add any new features after this. Warning 2.0: With the new deviantart design called Eclipse this app will die along with the whole custom background code community for sure. 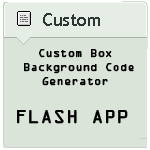 This little app generate Custom Box Background code after you provide an image url to it. This is the easiest way to get HTML code that makes your profile look awesome. You can check preview after you generated code. Pressing CTRL+C (or CMD+C if you are Mac user) button will automatically copy the code for you, so you can paste it in the custom box. Commissions are open for code! For some reason you can't use this app? I will send you the the code for 30 points. Check the commissions out on my profile pages's right side. I will accept your commission if you provide me all the info I need and you are a Core user. You can add it to home screen too, as this is a mobile web app. Do you want to support me? On the right there is a small custom box background image pack (25 images in a zip file). Click Purchase button on the right. Want preview? Check this out: sta.sh/0qtpybyf6ej But consider this: I do not support this app anymore, so I do not really expect you to support me. It isn't look good with featured images, ID, donation etc. Yeah. Because this works best with custom box widget. In any other cases there will be bugs like hidden content, spaces between content and top of widgets etc. There are workarounds for these but they will be still far from perfect. I am not a Core user. Will it work for me? Nope. This works only for Core users. Background image doesn't repeat This isn't an error. This is how it is. You must use a wide and tall image to cover all the background. (Update: As from v1.7.4 it is possible to repeat image vertically.) This is not an officially supported feature, so it is far from perfect. Background image doesn't fill the box horizontally It is because you use a too small image. To understand this better try to resize the window and see how the layout changes, you will see eventually it will fill it. The minimum recommended width for the image to use is 1000px. That fills the background even on bigger screens. There are no other way for this. Does this work at Groups? Not perfectly. At groups the image will push the content down. So you can use small image as header or something, but not as background. I am an Internet Explorer user. I don't have "copy image url" at right click. What to do? First of all: Don't be an Internet Explorer user. It is bad for your and your computer's health. But if you want to continue to be one, you should write a comment with an URL to the page that contains the image you want to use and I will give you the image URL. It hides donation button. What to do? Put several line breaks (press lot of enters in the text) before the last tag so the button is "pushed downwards". At donation polls it is a good idea to use low but wide image, so it only hides the donation amount. How do I replace the hidden featured image? You put the image's :thumbXYZ: code in the text OR you use the <img src="FEATURED IMAGE URL" width="400" /> HTML tag also in the text. Where the a "width" parameter will change the width of the image and you should set it so you are happy with the result (thank you for kissingcyanide for pointing this out). Without the width parameter the image can be too big and appear strangely hidden on the sides. There is a space on top of featured image widget: Set the view to "Normal view". There will be still a space at the top. But this is as close as you get. Remember the first FAQ. From now on the default text color is black. It was set red before this update that created some confusion. Minor bug fix at text color picker. New function: From now on you can select text background color. New function: From now on you can select text color. Centered text is optional now when background color is selected. I added 100px to the height of the app, so it have space for rearrangement. I changed the background color to match dAs new color. For people who can't get image URL by right click a new function is added! Just press the "Get IMG URL for me" button and copy the deviation URL there! It will get the img url for you, you just have to press the Get Code button. As it depends on my websites server, when my website is down, this function will be down too. Vertical repeat added! From now on you can repeat background image downward. A little something for you guys with very long content. It will have a small space between repeats. Sadly this is how this works, but more than nothing. A bug fixed where the preview wasn't show well (may still occur, more testing needed). This bug doesn't affect the actual result. Added Facebook button in help. If you like this consider liking my Facebook Page too, where I write news about this app too. Bug fixed: deviantART and Youtube button's help text was rendered behind the Get Code button. New function: text background. This is a deviantArt based white background for the text. Must be centered. YouTube button now opens the video page as its description also has information about the video. YouTube button now have deviantART colour when it is inactive. This is a minor change for better look. Button logic works better. After generating a code, when you click on the URL input you get the normal state of the app. Before this if you were in preview mode you lost all buttons. Minor change in source code. Minor change in help text. Help screen have new design. Donate button added to help screen. I fixed the preview. Now the background image is centered, as the real life boxes are centered too. Update v1.2: Better help text added. Thanks for Ilionej for suggesting it. element that will render content centered in the custom box. This is cool. It features how to B.G. a custom box. Cool, eh? ...Cool. Yesh yeh yeshhh! Even nice flash! I'll add this to my favorites! Yeah this rocks! Yay! 884 out of 1022 deviants thought this was fair. I hope this gets famous sometime. this is more like a comment, huh? 708 out of 789 deviants thought this was fair. The image URL is not working anymore. I know how to copy and paste a URL (I've done this many times before) but when I paste it, I get this. if i find a solution ill edit this! I hate that they did that. By the way, I'll try that out for myself! thank you for telling me about it! And no prob! I was coding last night and had the SAME issues so id thought id chime in and help. I'm very glad to hear that you're helping! Has anyone else experienced an issue when trying to place a text box or button in the widget with the background? They will go only under or above the background, never over it. I used to use this and I've looked it all up to make sure I was coding right, but it just seems I cant solve the issue. hey, I am having that same problem for like, 4 years, how did you fix that? Used for my Random Fav Widget! BG. Hi, I want to say a little problem what’s going on with this. Well the thing is it’s not working and showing up. I tried restarting the page nothing, tried going to the first version nothing, and I do have a core member ship. But still nothing is working to make this background code app showing up. So I hope this can be fixed soon and have a wonderful day to you. Flash is dead and this was made in Flash. Try an older browser that still supports it. Chrome still let you turn on Flash. On the other hand on mobile there were never Flash. Ok thank you for it and I’ll try it. hi, is a very awesome help, but i have a problem. i want the text black in the background, but everytime i put the code, the text is white, just works is isnt any background :/ i dont know why :/ can you help me? The mobile version doesn't work anymore. for some reason it won't let me us the URl code anymore. Used on my profile! I've been searching a thing like this...This is really helpful! Thanks for making it! well... thank you... I feel so professional now.. YOUR A LEGEND!! THIS IS AMAZING! THANK YOU S O MUCH FOR MAKING THIS!! all this is a hack, to get background for the text we use the button CSS from the site. Everything in it uses something else from deviantarts design to have different effects. To be honest I am surprised dA still let this thing work, but it is a good thing. I like it, but curently its not working.